We specialize in locating post tension cables and rebar embedded in residential concrete slabs prior to coring or saw cutting operations. Our clients are home remodeling contractors, architects, home owners and engineers. We have successfully located thousands of cables in hundreds of homes. To this day, we have never had a cable cut that we marked on a residential slab. We are the only company we know of that offers a $2000 guarantee. Most of our work is repeat business from contractors we have become friends with over the years. GPR is the most effective and accurate way of locating post-tension cables in a concrete slab. Why do homes have these cables in their foundations? - Southern California has native soils with a high percentage of clay content in some regions. These clays expand when they become moist and contract when they lose moisture. Many times the clay soils under the middle of a home are moist, while soils on the perimeter of a home become dehydrated. The perimeter contracts and the middle area remains expanded. This creates an elevation differential between the two areas that puts stress on the slab. This stress can be enormous, causing the slab to crack. Structural engineers design the slabs with post tension cables in an effort to make the slab act monolithically to counter the point loads created by the soil. The cables installed are usually pulled so they each have approximately 28,500 lbs. of tension. The released tension will find the path of least resistance. A very loud noise can be heard if the cables are cut while coring or saw cutting a slab. Experienced saw cutters will know immediately something has happened. Many factors affect what will happen if a cable is cut. Some cables just retract back into the slab towards the perimeters of the home. Some cables retract and protrude out of the slab on the side of the house. These types of cable cuts are relatively easy to repair. Other times the cables pop up above the concrete in several places in a sort of ripple effect along a line towards the perimeter of the home. This obviously destroys the concrete and flooring and can be quite expensive to repair. Injury can occur if someone is standing on top of the cable when it releases. The main reason to use our services is to avoid the worst case situation when a length of cable whips out of the slab and injures someone. This is a very serious situation, of course. 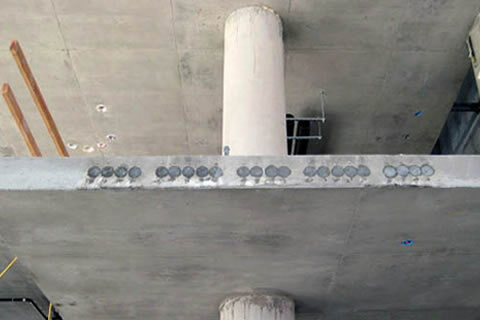 We think it would be negligent for a contractor to cut into a slab suspected of having cables without having them located. Don’t take a chance. Just call us, and we'll make sure.